Kim Whitby has just completed her MA in Fine Art at Aberyswyth University. 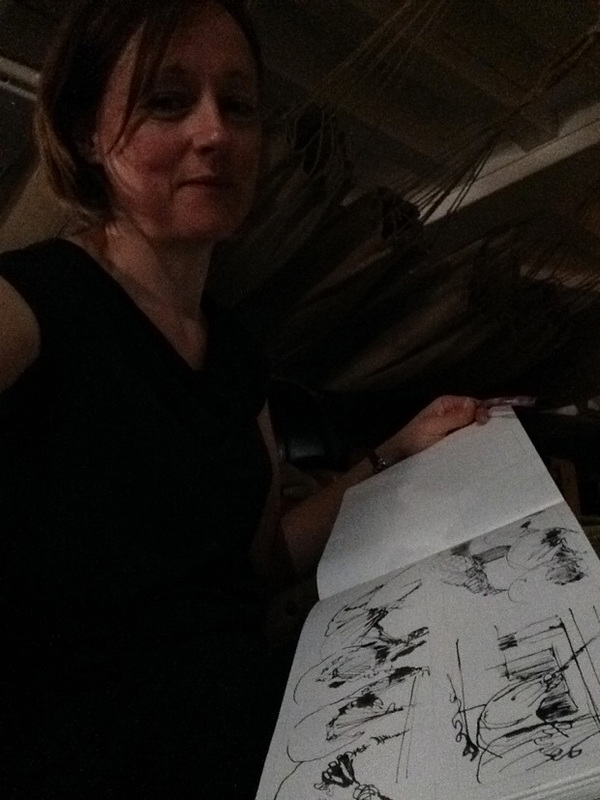 She got in touch to share her experiences of working on her final piece – an ambitious oil painting installation which reflected the sensation of standing inside the great Naval ship HMS Victory, looking out to the docklands of Portsmouth. A restricted view, is frequently how we visually experience the world. Our landscape is rarely without street furniture, posts, fences or buildings, even in the most remote and unspoilt areas of Britain. In my Fine Art Masters degree at Aberystwyth University I have been thinking about the way that we visually experience our landscape and environment, whether that is with physical interruptions that are part of our modern lives, or more formal barriers which prevent us from unrestricted visual access. For my final exhibition I spent three months evolving these ideas further by working in a space that is simultaneously public and restricted; HMS Victory in the Historic Dockyards in Portsmouth, which is a museum exhibit, sited within an operational Naval base. Having previously visited the museum, I was left with a very clear impression of views out from the ship, through the gun ports. This initial impression was core to the development of my final large panoramic paintings. HMS Victory was Nelson’s flag ship at the Battle of Trafalgar in 1805. It is now in a dry dock alongside the Mary Rose and many other Naval museum offerings. Lisa: ‘The way that we visually experience our landscape and environment, whether that is with physical interruptions that are part of our modern lives, or more formal barriers which prevent us from unrestricted visual access’ – What do you identify as the ‘more formal barriers’? Kim: The more formal barriers I mean are things like fences and railings. My previous academic painting was a long panoramic of views through the fence at the formal HMS Daedalus naval air base in Lee on the Solent. I was interested there in the way the landscape was inaccessible to the general public. 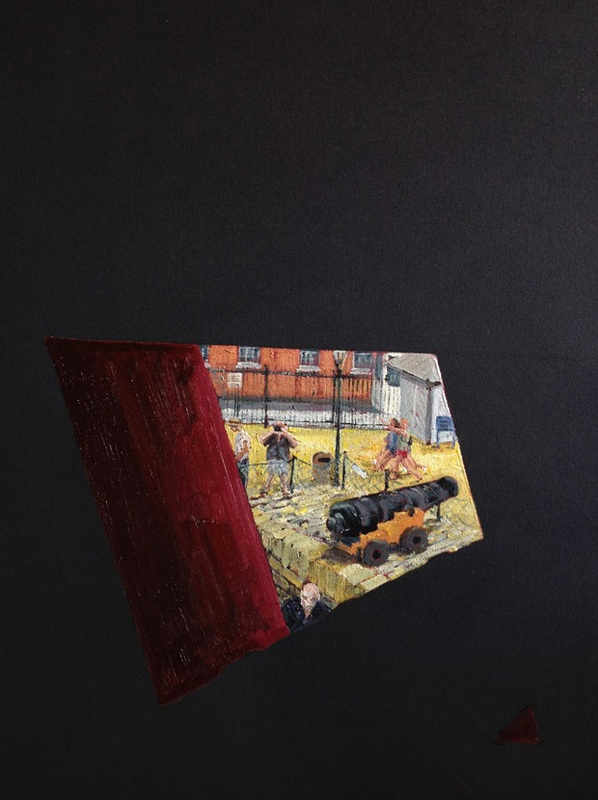 In my HMS Victory painting there are again many fences, railings and barriers to separate the two functions of the establishment, additionally there are various surveillance cameras and signs that prohibit access to certain areas of the site. Lisa: In your paintings what you refer to as the ‘physical interruptions’ become part of the landscape. What is the result of re-presenting a view in this way? Kim: The physical interruptions are everyday things like posts, telegraph poles, rubbish bins, signs…. I have always included them in my art work instinctively, and now consciously, I do not want to omit these from my work. I think that this would be dishonest. If everyday things are not included in paintings and it is all romanticised, then the work becomes purely decorative. It has nothing else to say. Even the most remote parts of Britain are peppered with man-made bits and pieces. Lisa: How important is black to you? Kim: Despite the canvas ground being very dark in the HMS Victory work it is actually a very dark blue. The dark colours that I use are made by mixing. Patrick Caulfield’s influence can be seen in the graphic linear additions that give a flavour of the inside of the ship and help to develop a sense of perspective as you look out. Apart from when I draw in ink, I rarely ever use black, but I do love tone. Lisa: Can you describe the way that you set about developing the compositions for your views from the ship – did you play around with where you physically stood to get the right view, is there any relationship between the view from one port hole to another? 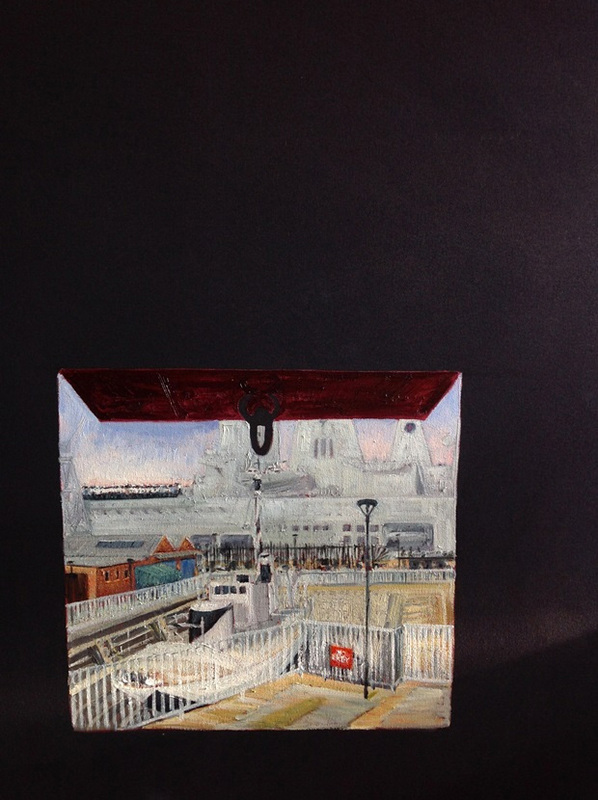 Kim: The views from the gun ports are selected views that I felt summed up the essence of the ships location. From my drawings I have totalled approximately 94 gun ports. Some views are angled looking downwards and others directed straight out.The views look at different aspects of the dock yard and different parts of the museum. I also wanted to get a feeling of observing the exterior rather like being in a bird hide. I have used almost a whole small sized sketchbook, working out exactly the views. This was developed with full size mock ups, on cheap coloured paper to feel how the scale worked in reality. Additionally I made three separate scale mock up models to explore how things would work. I showed this to the School of Art technician who had kindly offered to build a whole wall in the gallery for my painting installation to be hung around, as it helped to communicate what I was imagining. The anchor ports at the far end of the work are two out of four on the Lower Gun Deck, the single window with a curtain is one of seven in the Great Cabin, the door way is one of two on the Upper Deck and the three views down each side are three port or three starboard views. Lisa: Why did you choose to use oil paint to create your final pieces? Kim: During my MA I have worked my way through gouache paint…..acrylic paint….until I became frustrated with the way it dried so quickly and how thin it was and finally found my way to oil paint. Oil is much more malleable and substantial and now that I have begun to learn how to use it I really enjoy it. I deliberately avoided water colour paint as I had previously used it a great deal and wanted to change the way I painted. Lisa: You created many drawings and sketches as a means of developing your ideas for this work – what materials did you use to make these drawings and what did the materials themselves lend to your creative journey? 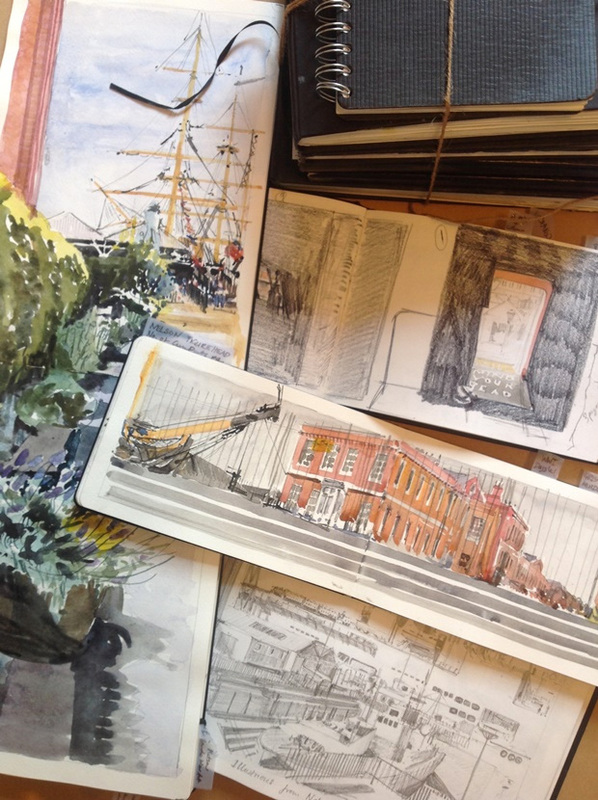 Kim: In these final MA preparation drawings I allowed myself to return to watercolour. I think this years very hot Summer with bright sunlight lead me back, and I had a lot of fun using them in sketches again. However these accidentally turned out to be invaluable references when I began my final pieces as I found that they were a much more useful source of tonal information when mixing my oil colour than any photograph. I also used quite a lot of ink in my preparation drawings too. I use this diluted as well as neat and blotting paper when I can get some that is good quality, otherwise it can smudge! I apply this with watercolour brushes, calligraphy brushes, house painting brushes and dipping pens. Lisa: What was your oil paint of choice and how did you go about selecting your palette? Kim: My oil paint brand of choice has been Daler and Rowney Georgian artists … It’s been the best I can afford in the quantities I need. I use Cadmium yellows and reds, Alizarin Crimson, Cobalt blue and white. I have also used Phthalo blue when mixing darks, but I’m becoming dissatisfied with it at other times and am looking to change that at the moment. I don’t like the greenish tint that it gives to other colours. I have the same colours in watercolour pans. 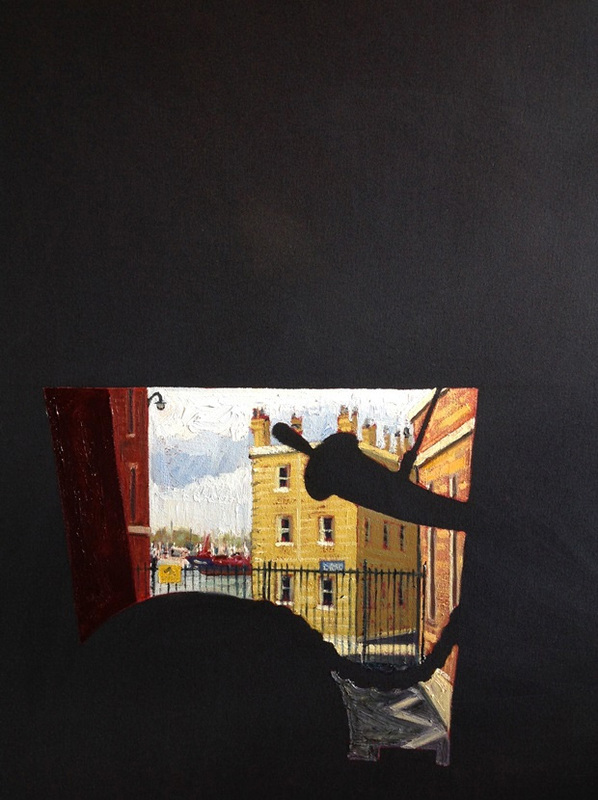 I have examined and copied the colour work of Nicholson and Diebenkorn over my course. They have a very limited colour palette also. I have learnt masses from doing this. I have had a great deal of support in both composition and paint, from my supervising tutor at Aberystwyth School of Art, throughout my MA. As a teacher myself (infants and primary), returning to more serious artwork, I realised one day that I would learn much faster and make much greater progress if I was around people whose business it was to teach art all of the time. This has been one of my better brainwaves. I cannot be happier with the development that I have made part time over two years in Aberystwyth. I have been able to continue to earn money teaching whilst persuing my artistic goal. Kim: Currently I am endeavouring to maintain some of the momentum that I have built up during my course. I am applying for things on the Arts council website that catch my eye and taking commissions, alongside my supply teaching work. I would like to earn more from my art than the teaching in the longer term but I also have teenage children who like to eat too so it’s a balancing act. Having relocated during the last year too, I am working to make new artistic connections down here in Hampshire. Kim: My website has a contact page for getting in touch with me. I have updated my website last month so it is fresher and clearer for my post MA life. Find me and a link to my MA YouTube HMS Victory exhibition video on ….